La Belle Dame Sans Merci is not a narrative poem because it implies rather than tells a story; it is a literary ballad, which has visionary insight and emotive sadness occasioned by the loss of that vision. ‘It is a poem of impression’ (William Michael Rossettit 1887) and can also be considered to be about the poetic process itself. Mario L D’Avanzo argues that the poem contains metaphors about the poetic process, poetry and the imagination. The dying season starts and finishes the poem. The landscape is one of desolation in which the Knight is a visionary wanderer and lover. Poetry is represented as a woman and the poet as the knight-at-arms. According to Wasserman, the knight represents all mortals who engage in the ‘imaginative struggle’. Do also note that because the French medieval knight was also a troubadour, achieving poetic excellence through love, the knight is also a very appropriate figure to represent the poet. Pastoral setting: the knight meets La Belle Dame in the isolation of the meads. Her long hair is an image of beauty, imaginative inspiration and imaginative vision. Wild eyes suggest the untamed energy of the creative. Once on the ‘pacing’ horse of regular metre, the imagination takes over the enthralled poet. The ‘elfin grot’ is the sanctuary of poetry. 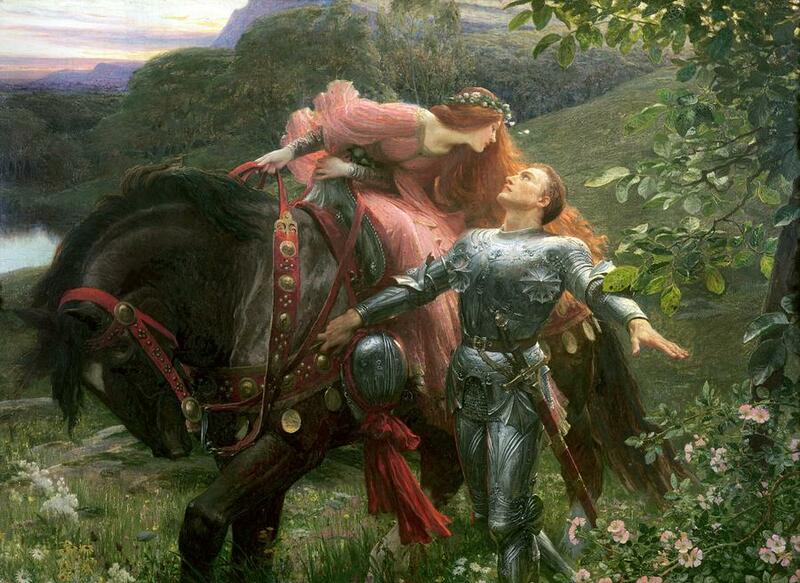 The knight and La Belle Dame is a pairing of the mortal with the immortal. The first 3 stanzas show medieval ballad trappings. The time of year has metaphorical implications. The poem has a fairy tale atmosphere: La Belle Dame is ‘a faery’s child’, she sings a ‘faery’s song’, speaks ‘in a language strange’, takes the knight to an ‘elfin grot’. She has visionary imagination. Perhaps she is Circe, leading men to their destruction. More recent interpretations address whether it is the Knight’s inability to retain the vision that causes the union to be broken – consider this with regard to heaven’s bourne (above).